I’m just back from National Products Expo West, the world’s largest natural, organic and healthy products event. It was my fifth year attending; I always enjoy new and emerging brands, as well as new offerings from known brands. Since I am personally grain free, soy free and dairy free (and nut free most of the time), along with having two gluten free children, I’m always on the lookout for soy and dairy free foods, as well as healthy options in the gluten free arena. I’m so pleased to constantly find allergy friendly food brands and their offerings that can suit those in need. 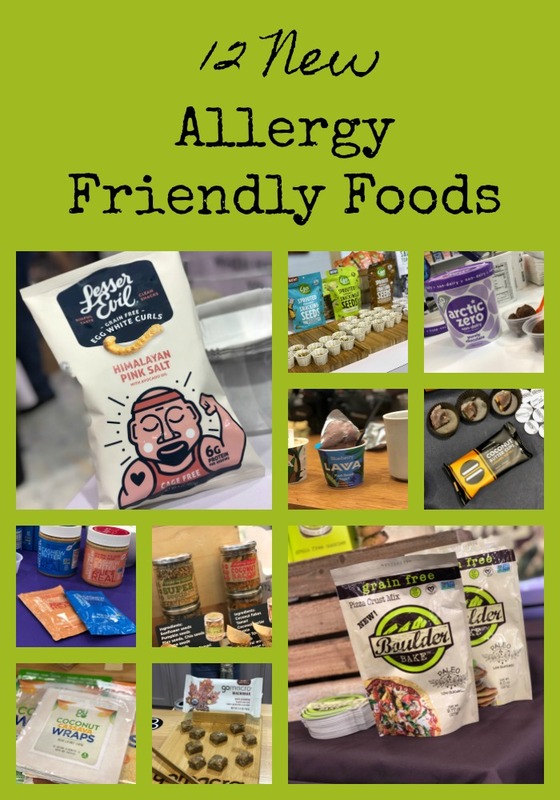 Below are twelve of my favorite new allergy friendly foods that I saw at the show. Keep in mind that not all will suit one diet in particular – but if you are looking for egg free foods, dairy free brands or grain free snacks or options, keep on reading! I’d love to hear which ones sound the best to you. Oh and some of these are not available in stores just yet, but will be coming to a store near you soon. Let’s check them out! 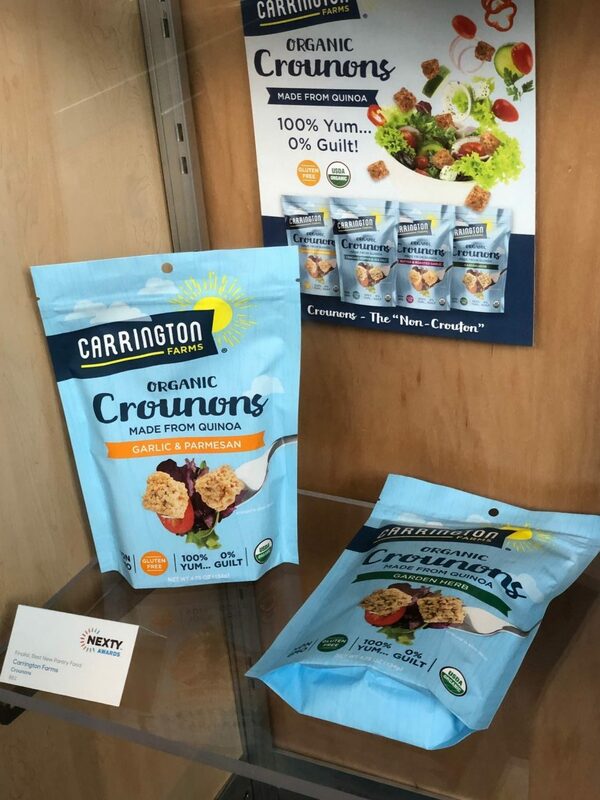 Carrington Farms Organic Croutons Made from Quinoa – a unique blend of quinoa, quinoa flakes, tapioca syrup, coconut oil, banana powder and a few spices make these croutons a great grain-free option for those who are unable to tolerate nuts, gluten and grains. Stick them in your salad, or snack straight out of the bag. 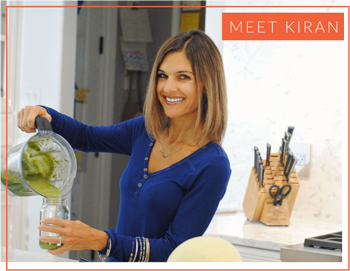 Primal Kitchen No Soy Teriyaki – Primal Kitchen is one of my favorite brands for clean marinades and dips. Made with organic and recognizable ingredients, they are convenience foods and condiments that fit into our lifestyle and which are better options. While I occasionally attempt to make my own salad dressings, I feel confident about using their offerings. I also like how their BBQ Sauce and Ketchup are unsweetened. Their newest addition, Soy-free Teriyaki, is perfect for those of us who try to avoid soy and will be making a permanent spot in my pantry once it’s available! 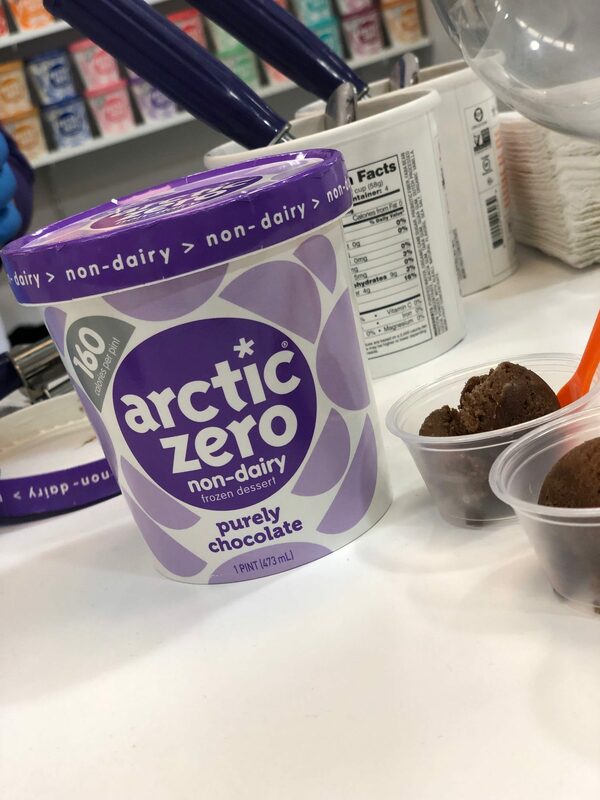 Arctic Zero Non-Dairy Ice Cream – So since I’m lactose intolerant, I pretty much have gone my whole life without ice cream. Sure, I’ve survived with other desserts, but there are definitely times when I’d love to indulge, so I was excited to try Arctic Zero’s Non-Dairy Ice Cream, made with fava beans, sweetened with monk fruit and no sugar alcohols! While I only tried the Purely Chocolate flavor, I was more than pleased with the creamy, full texture and look forward to stocking my freezer for when cravings call. 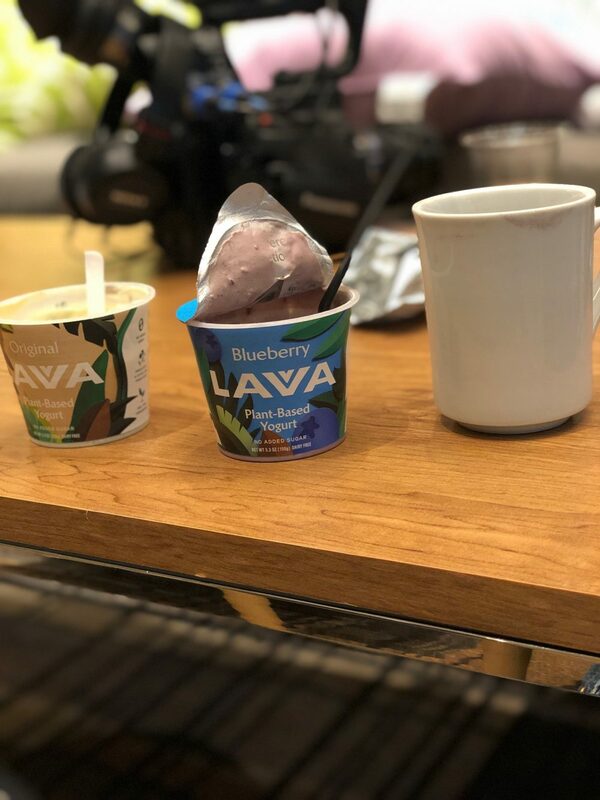 Lavva – I’ve been lactose intolerant for most of my life, so yogurt has been one of those foods that I’ve simply missed out on … until now. Lavva is an allergy friendly food brand to makes a plant-based yogurt from piri nuts, plantains, coconut and cassava; it has pre- and probiotics and no gums (typically used for thickening agents). There is no added sugar and their flavors are spot on. I’m so happy to have these plant based yogurts available and know that others who are lactose intolerant or who have dairy allergies will also enjoy these. 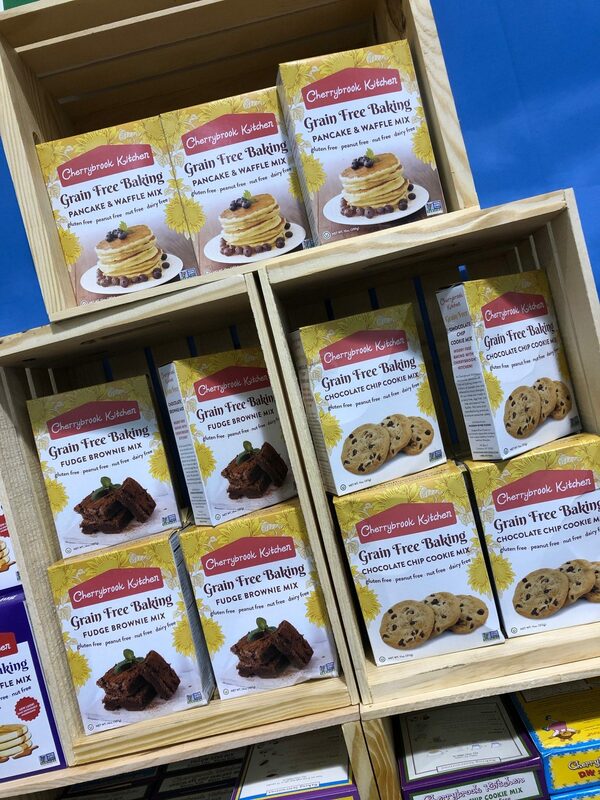 Cherrybrook Kitchen Grain Free Pancake & Waffle Mix – This brand offers many allergy friendly foods, including super tasty grain free brownies along with these new(er) pancake and waffle mixes. I’ve tried both vegan and non-vegan versions of them and I am a fan! 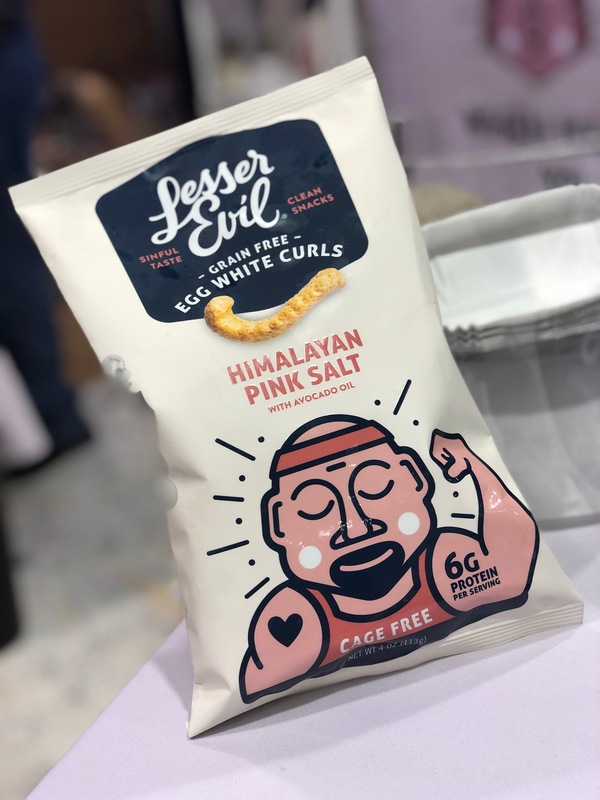 Lesser Evil Grain Free Egg White Curl Snacks – Lesser Evil is my go-to for grain-free snacks, including their Grain Free Paleo Puffs. You probably also know them for their organic popcorn, and they just added protein-packed Grain Free Egg White Curls to its lineup of better-for-you snacks. Available in 3 flavors, they offer 6 grams of clean protein from sustainably sourced cage-free eggs. Also coming soon to a store near you! Go Macro Maple Sea Salt – New to the lineup of vegan, nut-free, gluten-free and non-gmo bars is a super tasty flavor: Maple Sea Salt. 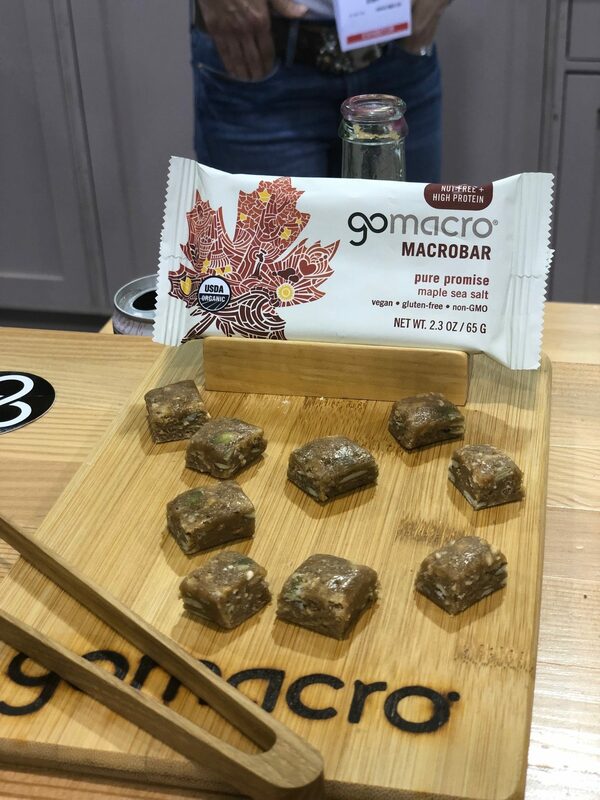 I discovered Go Macro Bars while doing the Low FODMAP diet and have been a huge fan ever since. I buy these bars for my two girls who are gluten free and will have an order in for this new delicious flavor as soon as it’s out! 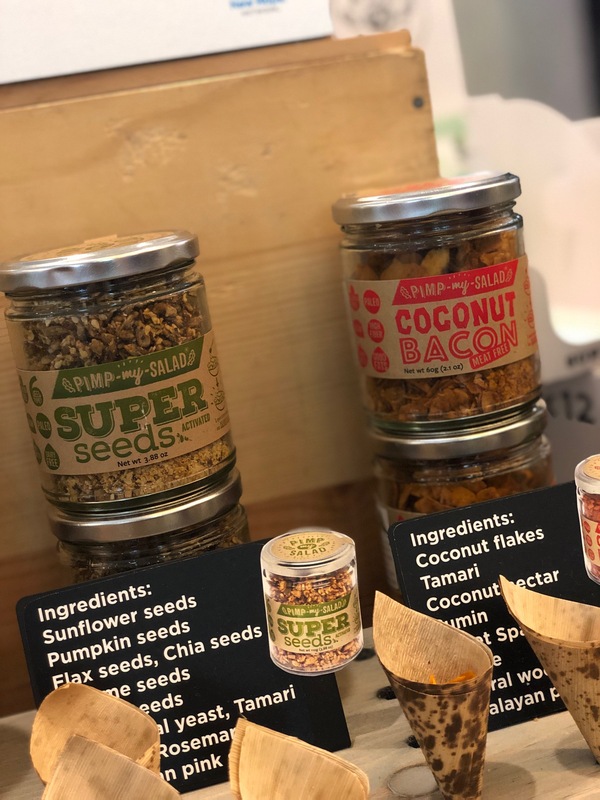 Pimp My Salad salad toppings – Coconut Bacon (meat free), Hemp Parmesan and Super Seeds are just three of the offerings from this newer brand to bring tasty toppings to salads across the nation without the inclusion of gluten or nuts. Simple, real food inclusions round up these crunchy bits that I’m loving on salads, atop roasted veggies or simply by the handful. 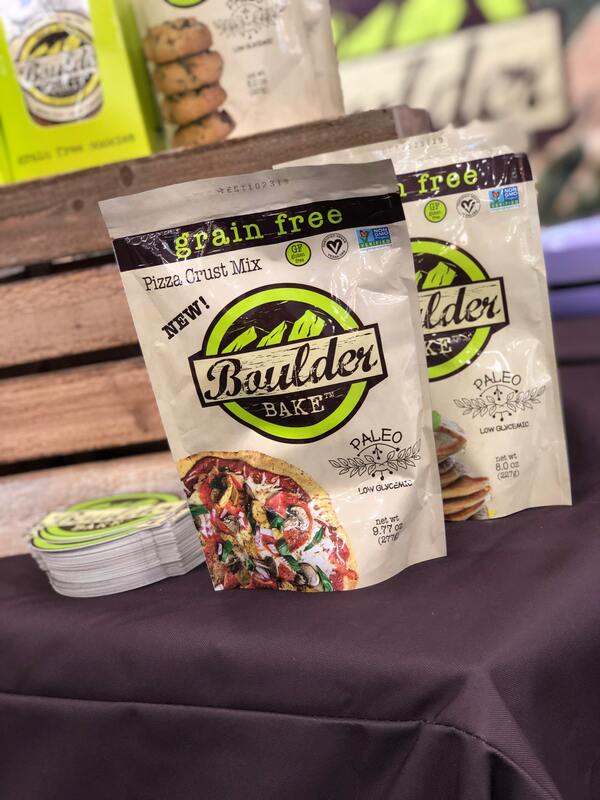 Boulder Bake Grain Free Pizza Crust – Paleo-friendly, gluten-free and Non-GMO Project Verified, this tasty pizza crust comes in an easy-to-make pouch and provides a simple solution for those of us who can’t do grains, but still want to do pizza:). Coming from someone who is grain free, I have to admit that this pizza really exceeded the taste of others in the category! I’m a new fan who will be making this for lots of years to come. This is so new, that it won’t be out for a couple of months. In the meantime, their Paleo brownies and Paleo Pancake Mix are highly recommended, too! 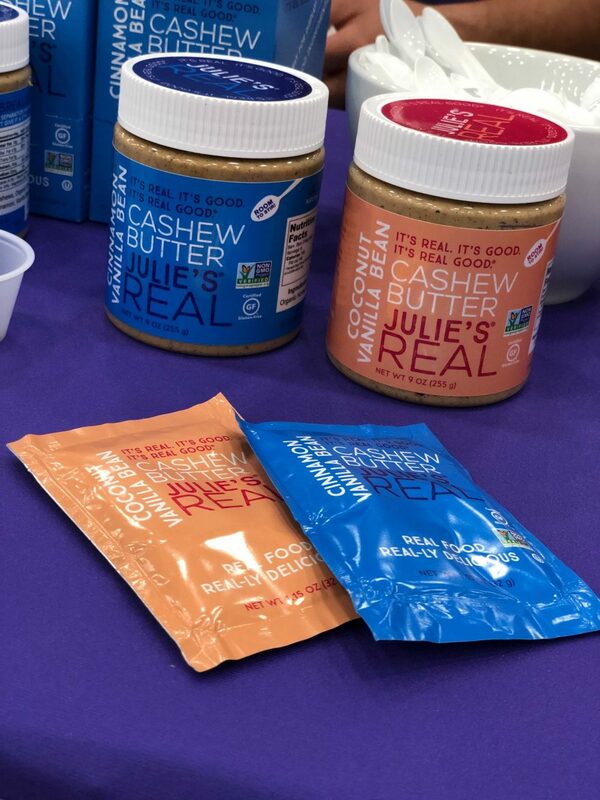 Julie’s Real Cashew Butter – Sure, there are other nut butters out there – but none that are as creamy and which taste as good as Julie’s! Sweetened with a touch of honey, the Cinnamon Vanilla Bean is my favorite flavor with a close second, Coconut Vanilla Bean. Yes, this contains nuts, but it’s a nut butter that’s a solid alternative for those who can’t do peanuts, soy, gluten or those who are Paleo. 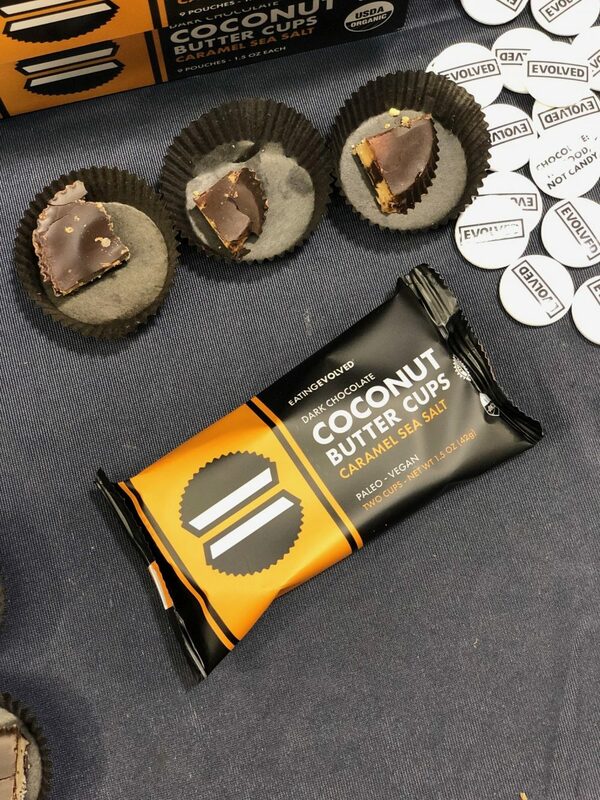 Eating Evolved Coconut Butter Cups – Nut and peanut butter not on your good list? No worries, because Eating Evolved has got you covered! These keto- and paleo-friendly treats are the (fat) bomb.com, a solid treat that you needn’t worry about indulging in! Ingredients include organic coconut, cacao, coconut sugar and cacao butter. 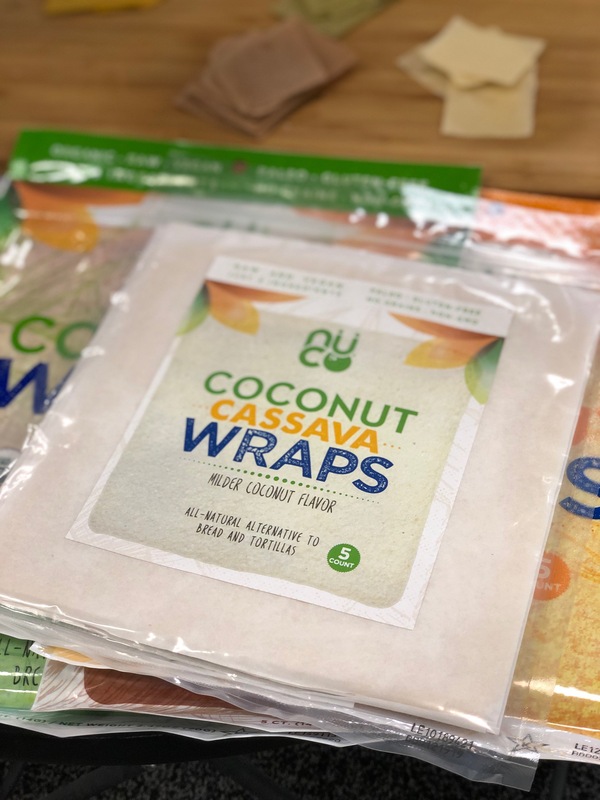 NuCo Coconut Cassava Wraps – Last but certainly not least, a solid alternative for paleo and grain-free individuals who still crave the occasional bread or tortilla. The light texture of these grain-free wraps are perfect for rolling up your favorite goodies – think greens, meat, shredded carrots and guac, or even stuffed with a little banana and Sunbutter. And that’s a wrap! Thanks for this amazing list of products! I want to try them all!